Experience the internationally acclaimed and award-winning digital card and board game that has enamoured PC and console players! Easy to Play but Hard to Master: Armello is easy to pick up and experience, yet its deep and emergent possibilities emerge as you play. Includes acclaimed story-driven tutorial mode. Fast & Thoughtful: Adventuring in Armello is fast-paced fun filled with deadly, tactical and politically complex decisions. Multiple Playable Heroes: Each unique Hero possess a special power, stat line, AI personality and can be equipped with an Amulet and Signet Ring to further match your playstyle. 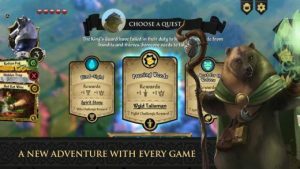 Dynamic Sandbox: Gorgeous dynamic world which procedurally generates a new map each and every game, complete with a dynamic quest system ensuring no two games of Armello are ever the same. Turn-Based Day & Night Cycle: Use Action Points to journey across Armello’s hex-based board and use our fuzzy turn-based system to play cards even when it’s not your turn. True Tabletop Feel: We’ve spent years cherry-picking the best parts of the tabletop experience, like our physics-based dice. Animated Cards: Over 150 beautifully animated in-game Cards from artists all over the world. World Class Soundtrack by Michael Allen and internationally acclaimed artist Lisa Gerrard. 1) Compatible with iPad Mini 4, iPad Air 2, iPad 9.7″ and iPad Pro, iPhone 6 and up. Armello WILL NOT be able to run on earlier generations, even if able to be installed. 2) Armello requires asset installation after updates. We recommend you do this from a stable WiFi internet connection to avoid disruptions or cellular network fees. 3) Armello is a graphically rich game with advanced features. To OPTIMISE your playing experience, you may want to turn off other apps before playing. 4) Armello’s Monthly ($6.49 AUD), 3 Month ($12.49 AUD), & 12 Month ($29.99 AUD) Subscriptions grant access to all premium content, including all Heroes, all Hero Skins, The Bandit Clan, Seasons Board Skins, all Premium Dice. Subscribers also gain access to exclusive, evolving subscriber Badge and Dice and a 10% discount on Chests! Please note that subscriptions in Armello will be charged on your iTunes account after purchase. Your membership or subscription will renew automatically if you do not cancel at least 24 hours before the renewal date. Your subscriptions can be managed and auto-renewal may be turned off by going to your Account Settings after purchase. Should your subscription lapse, purchased content will persist, however all content granted via subscription will be inaccessible until subscription is renewed. It doesn’t look like it’s going to be addictive but… wow! I have been unable to put it down for the last week, the games’ lengths are perfect and working towards new characters is fun. There are only two issues I have with the app, numero uno, you can’t listen to any audio that doesn’t come from the game, without turning off the games audio itself. Also if you are listening to external audio and try to start a new game… you can’t, it looks like the king can’t say the opening line and thus the trigger to actually start your turn will never be activated. Overall, good job LoG, you’ve made a fun game also… go Australia! I’ve tried and retried to play this game (it looks like it has beautiful gameplay) but whenever I get to the language page, it won’t let me click anything. After that, the next few times I open it, it crashes immediately. I am using on an iPhone 5s and it is up to date on updates. Please fix this, because I really want to access the app!! Thanks a ton, and I hope you can fix this! !